Long since gone are the days of gigantic steel cars. 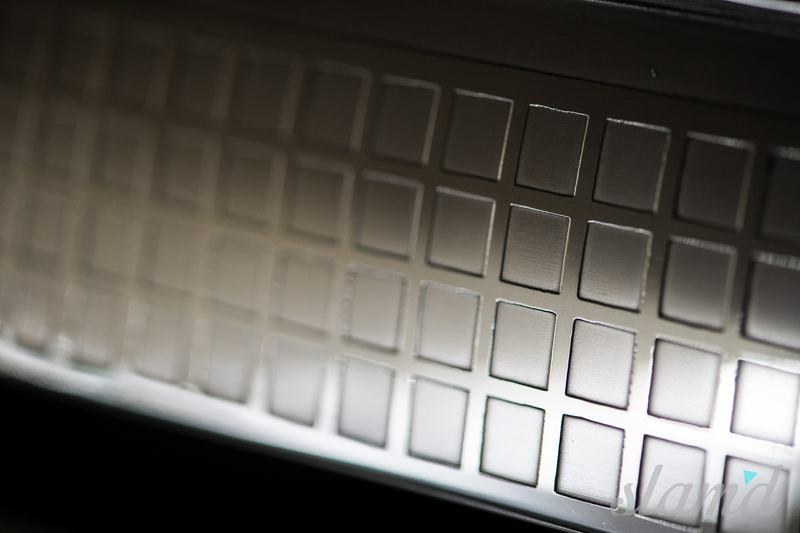 Modern technology allows for engineers to manufacture lighter, cheaper materials at a rapid pace. But modern technology can never account for soul. Without fancy CNC assembly lines and rigid rigid aluminum tooling, auto manufacturers once relied on style to sell their vehicles to the masses, paired with a mindset that attaches pride to hand-made excellence. 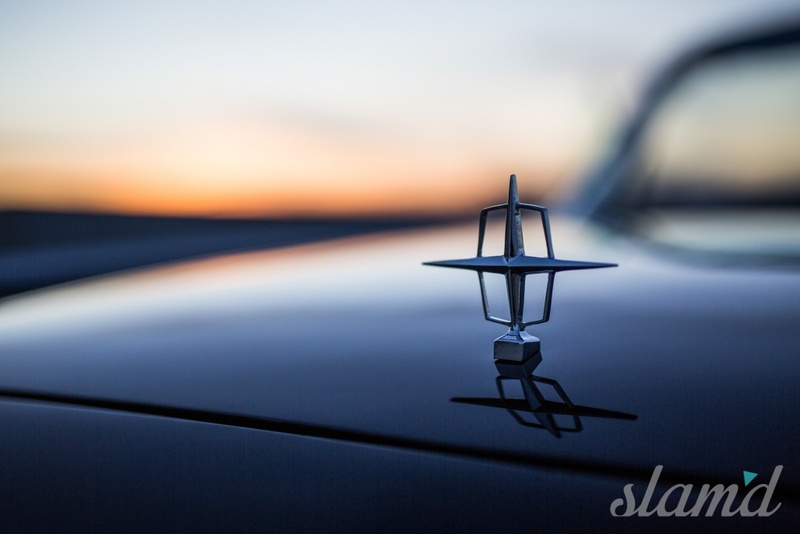 It is likely that the elegance of mid-century auto-making will never be seen again. 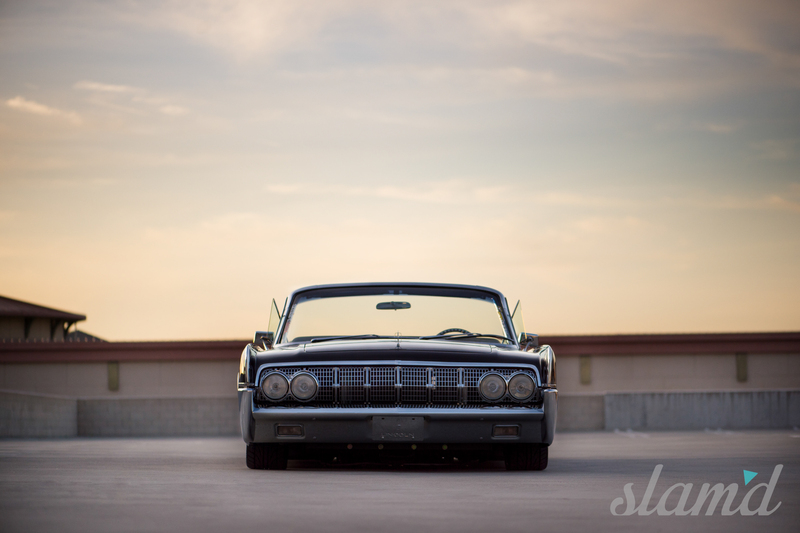 This is why builds like Tony Leal’s 1964 Ragtop Continental are vital to the soul of the custom automotive industry. When passion, quality, and determination meet, the result is brilliant. 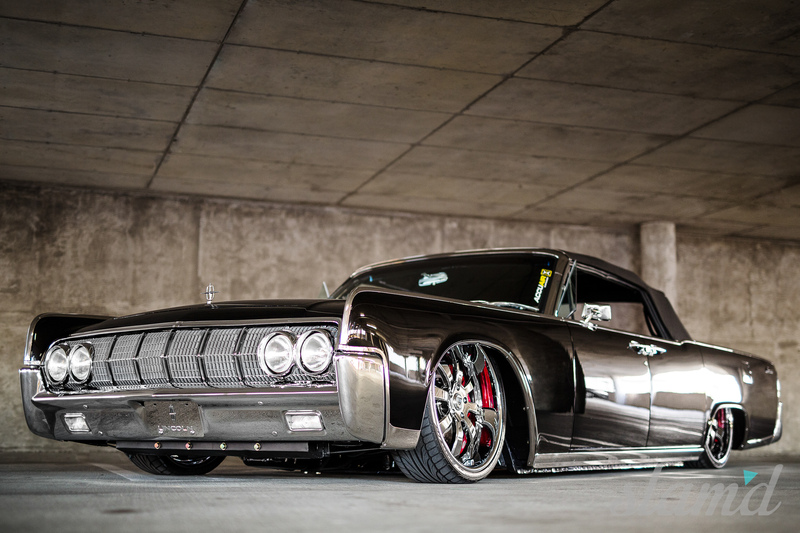 Tony’s ’64 is a bespoke project, combining the very best of custom-made and aftermarket support. 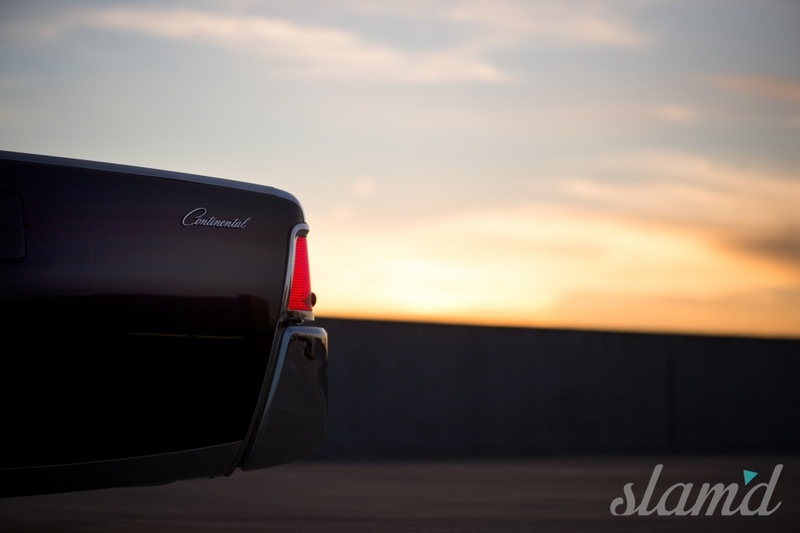 Starting with the Lincoln’s chassis, it begins with a from-the-factory unibody construction. 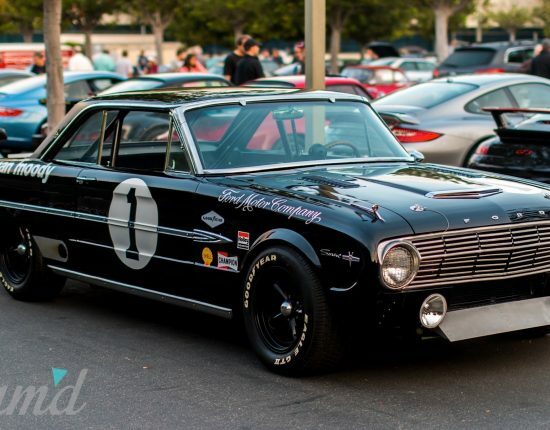 The Continentals were underpinned by an extended version of the Thunderbird chassis. 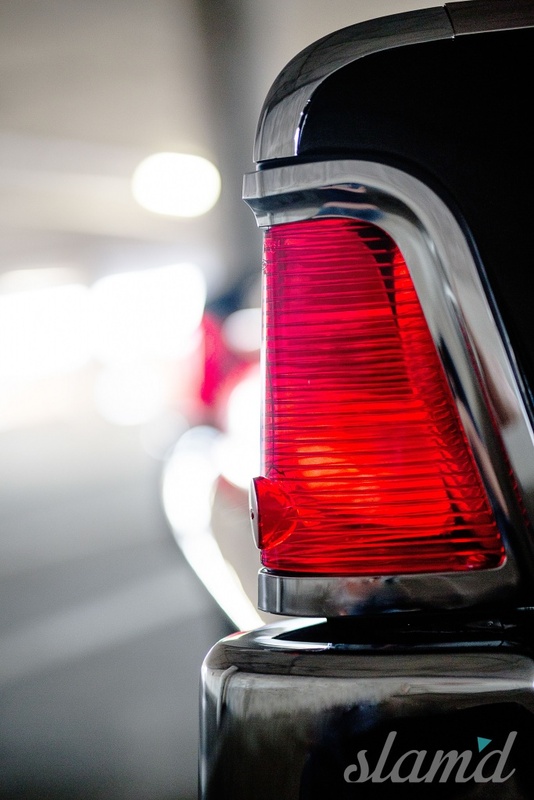 In 1964 Ford increased the wheelbase from 123 to 126-inches. The mild gain partially accounts for the 1964 model’s iconic stance and presence. The underside of Tony’s SLMD64 is as well put together as what’s on top, and that’s definitely saying something. The Lincoln uses a combination of RideTech and custom suspension components. Up front are tubular a-arms finished in black powder and RideTech. In the rear, rests a custom triangulated 4-link for maximum suspension travel. The rear is suspended with Ridetech HQ Shockwave struts. The highly capable suspension drops the chassis to the pavement. It also allows for a superb ride and limitless adjustability at the touch of a button. 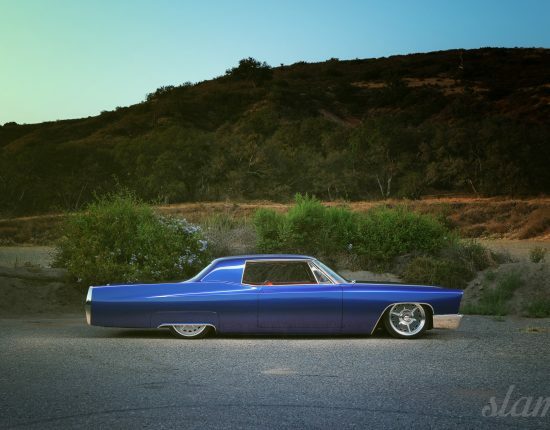 Working hand-in-hand with the top shelf suspension, Tony’s ’64 sports a set of one-off wheels. 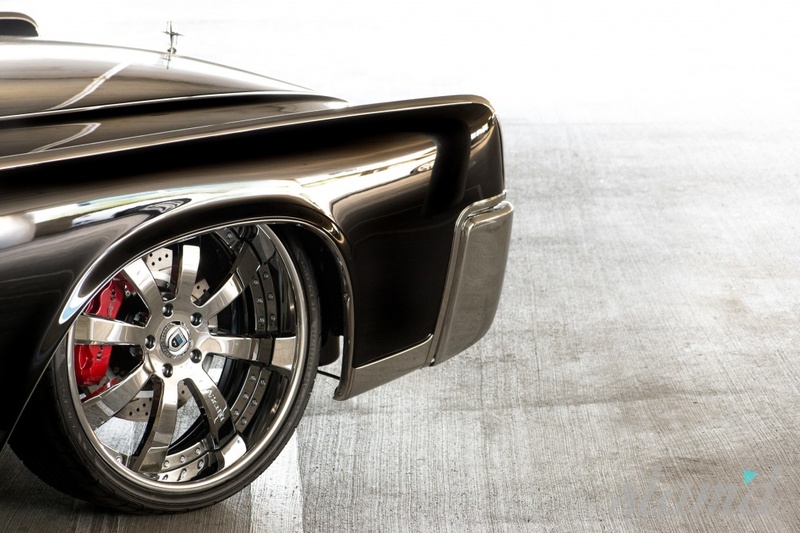 The 3-Piece Asanti wheels span 22×8.5-inches in the front and 22×10-inches in the rear. They are paired with Falken FK452 low-profile tires. The rubber measures in at 255/30/22 and 295/25/22 respectively. The Asanti’s are finished in a dazzling chrome polish. The finish gives a focal point to the black and chrome scheme throughout the build. Flush-mount chrome hardware on the barrels juxtapose with the classically styled smooth smokes. 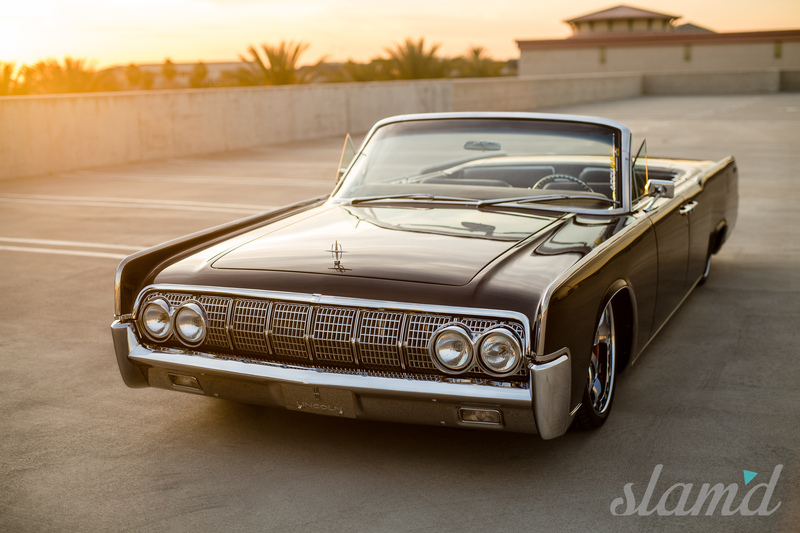 The result is a well-struck balance of resto-mod and classic attitude. 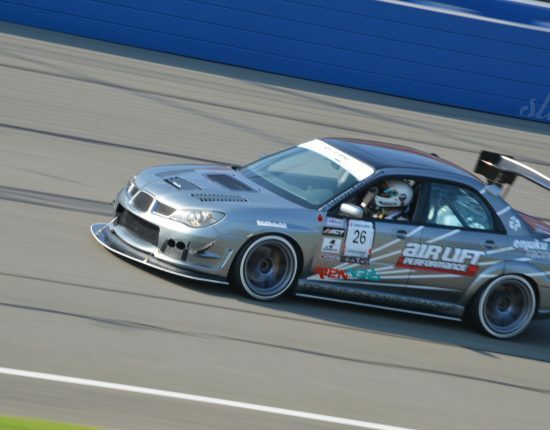 Further aiding the powerful stance, are colossal Baer brakes 6-piston front and 4-piston rears that are fitted with drilled and slotted rotors. 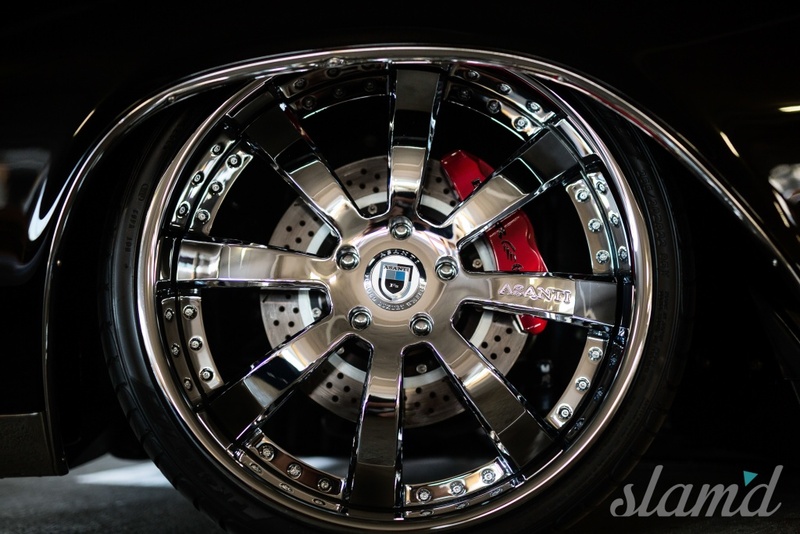 The potent stopping power is controlled with a Hydroboost brake booster. 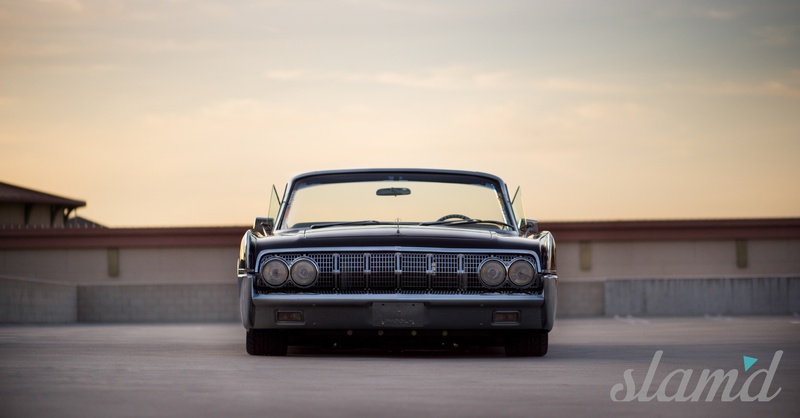 The 1964 Continental model was powered by Ford’s 7.0L V8. The 430 cu in engine, commonly referred to as the “Bulldozer” motor, made 430hp in its 1964 raiment. Its hooked to a C6 3-speed transmission. The original trans is supported by an aluminum auxiliary cooler. 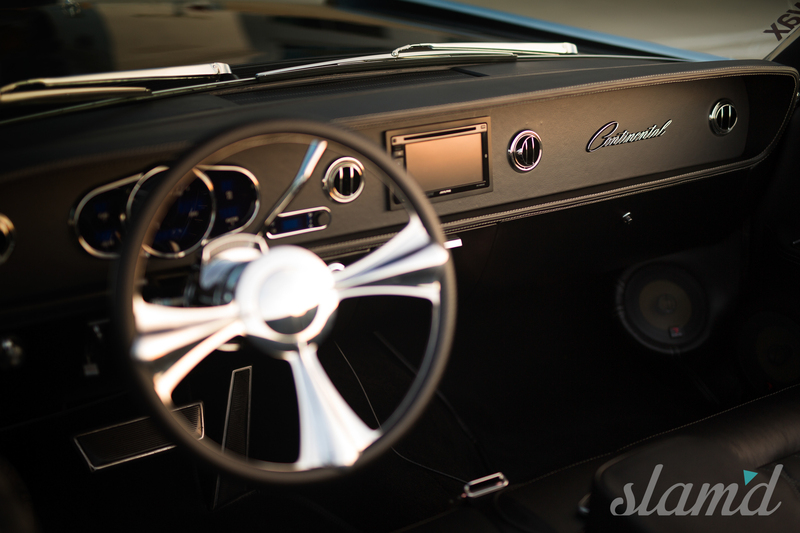 The Bulldozer in Tony’s ’64 has been thoroughly refreshed. The block has been smoothed and painted black, giving the engine bay a center point of cleanliness. 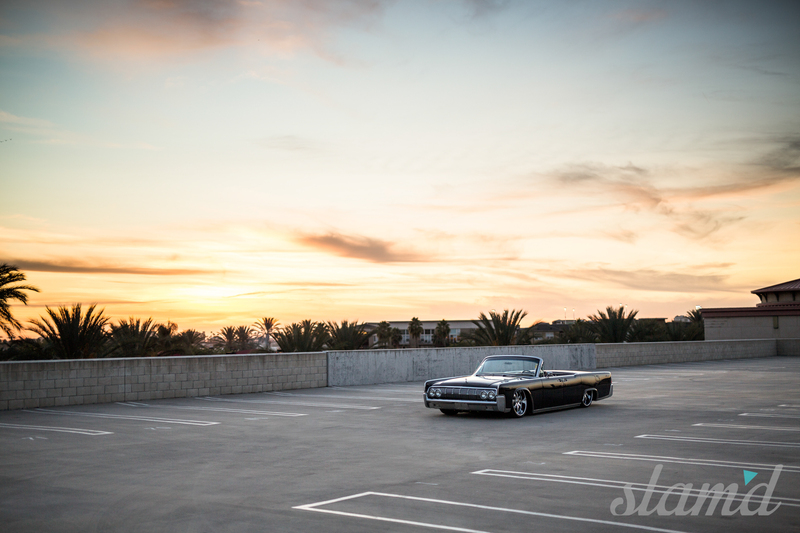 It breathes through an Edelbrock 750cfm carburetor and paint-matched air cleaner. 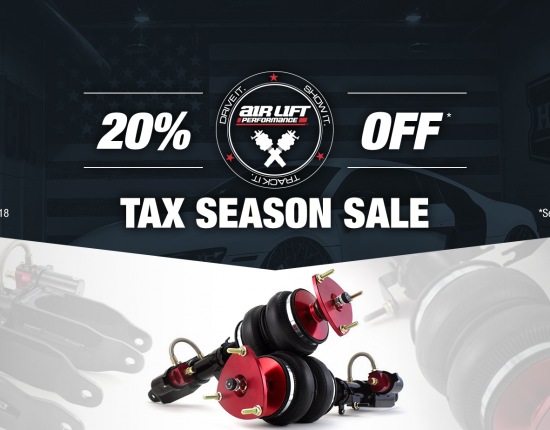 The exhaust is made up of custom ceramic coated headers and a stainless steel true-dual system. The engine bay is kept cool with a custom aluminum radiator. The fan shroud, overflow bottle, accessory drive, etc. have all been painted black. Fresh lines and hoses are tucked cleanly throughout leaving the engine bay immaculately simple and functional with every part in plain sight. For any builder, approaching a 1964 Continental poses a unique set of challenges. 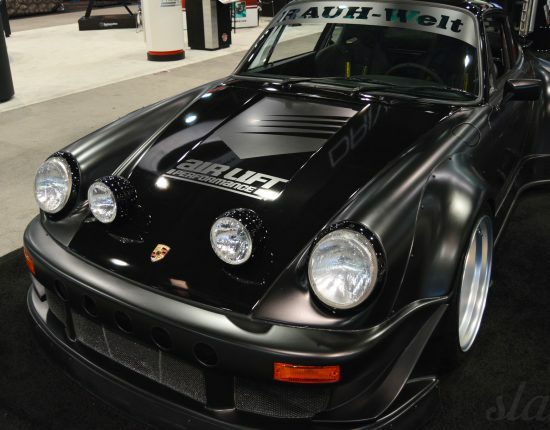 The model is so iconic that even minor exterior changes can cause a dramatic effect. Dramatic effect is not always a good thing. To solve the dilemma, Tony uses subtle body modifications. These enhance the aesthetic, rather than redesign it. 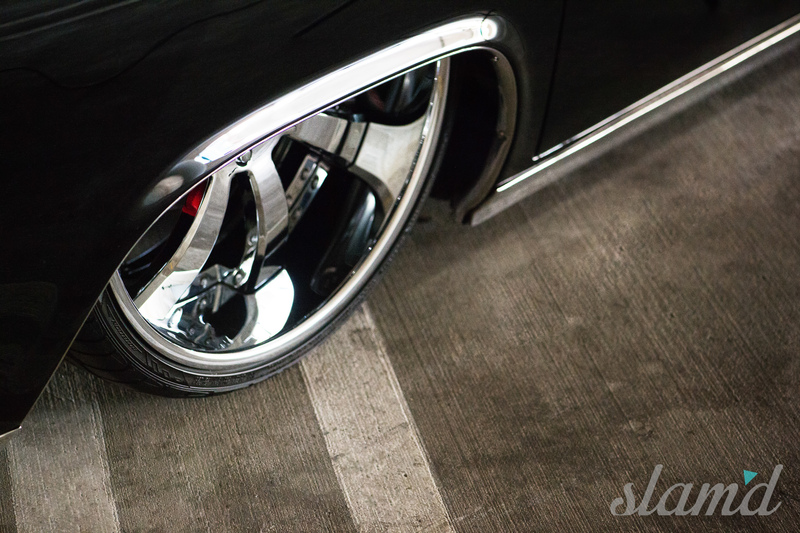 Each body panel is outlined in restored chrome. 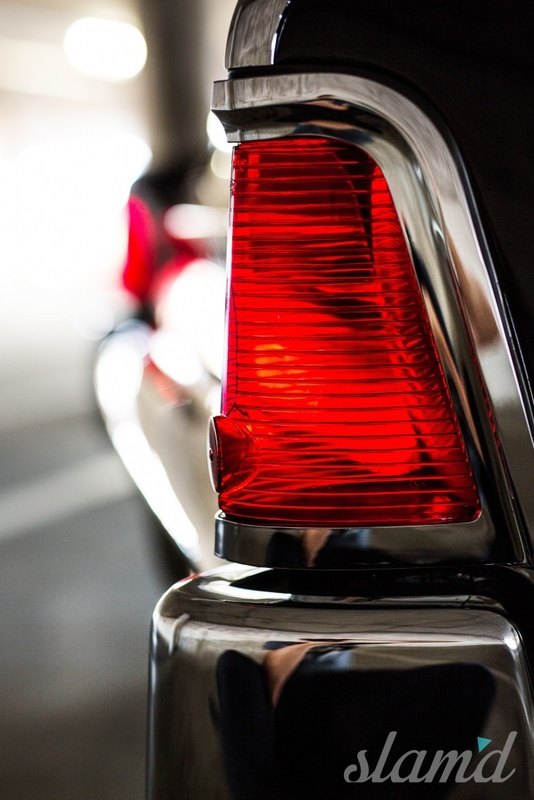 Chrome trim extends from nose-to-tail, hugging the singular peak that serves as the fender ridge, upper door line, and tail fin. It extends from each bumper, over the fender arch, and along the rocker panels. 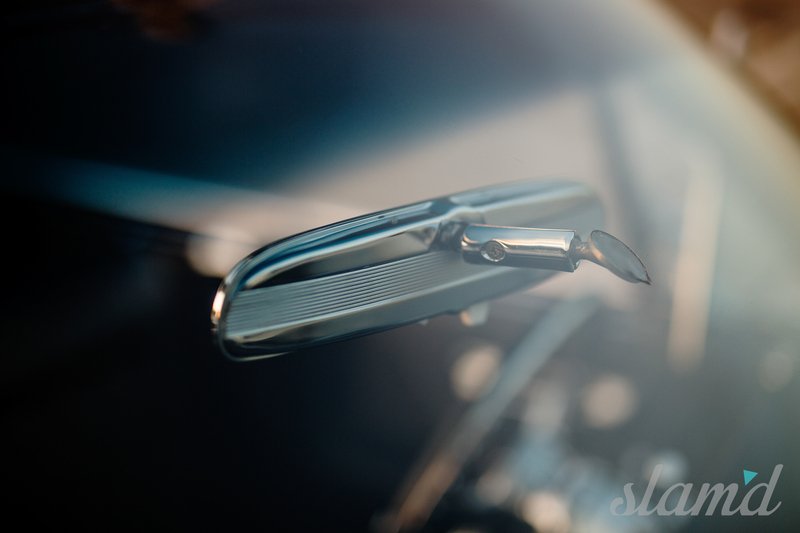 The front and rear bumpers are solid chrome units, polished to a mirror finish. 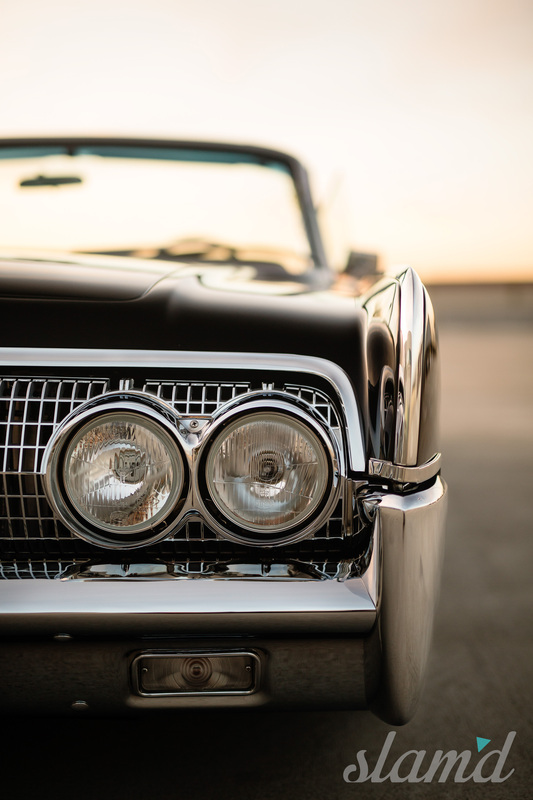 1964 marked a subtle change in the grille styling which included vertical chrome markers to break up with close-set webbing. Tony’s ’64 uses its factory grille with H4 headlights. The factory chrome door handles, side mirrors, windshield and taillight trim all remain in place. While Tony’s Lincoln is an original ragtop model, the canvas roof it now sports is a custom piece. The anti-glare glass windshield and custom tinted windows provide an understated exterior compliment. 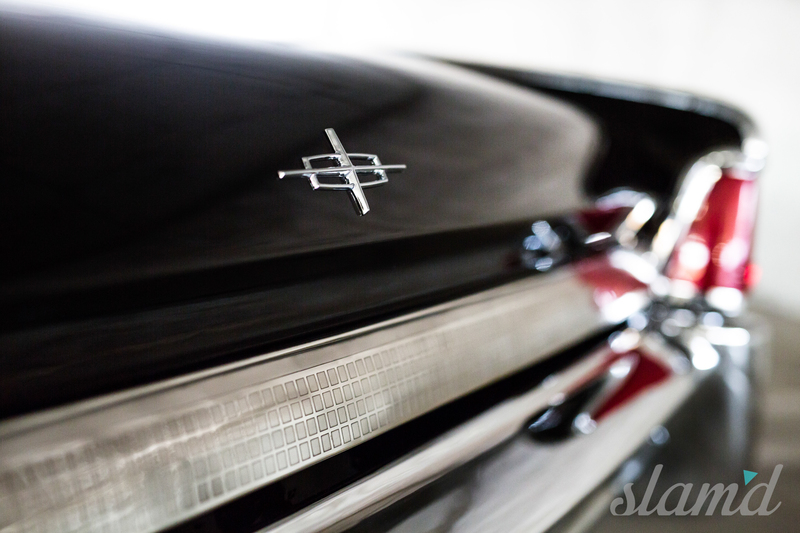 The simple scheme of black on chrome is executed in gorgeous. PPG Triple Black coats the body. The paint’s clarity gives the impression of being fathomless in depth. 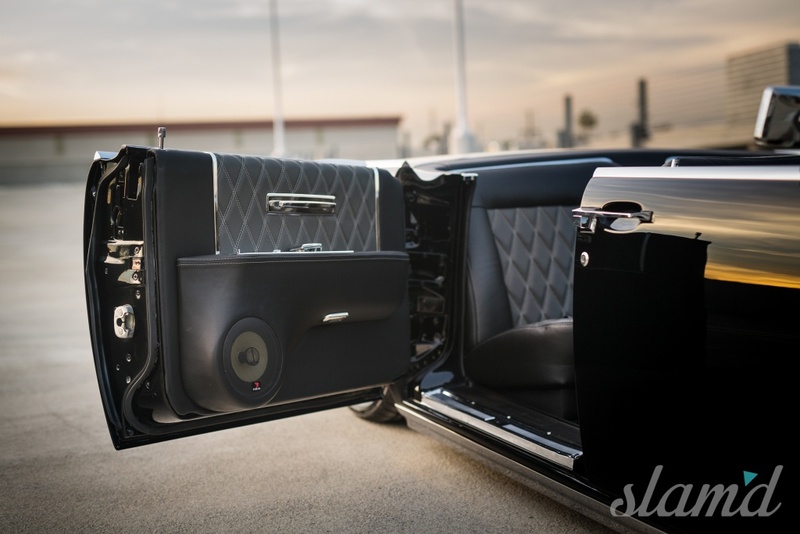 The interior of Tony’s Lincoln contributes more than its fair share to the overall beauty of the build. The ’64 model’s extended wheelbase is most noticeable in the expansive rear seating room. With the roof tucked invisibly in the trunk, the 64’ interior gives off a yacht-like impression. Every inch of the interior has been covered in modern materials. The material used still captures their classic counterparts’ appeal. 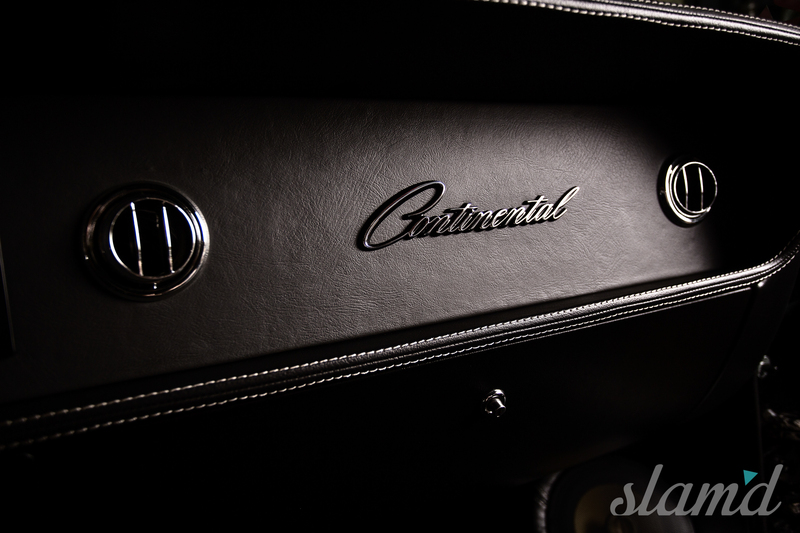 The low-slung seats are custom upholstered in black leather with grey inserts. The inserts use double diamond stitching. 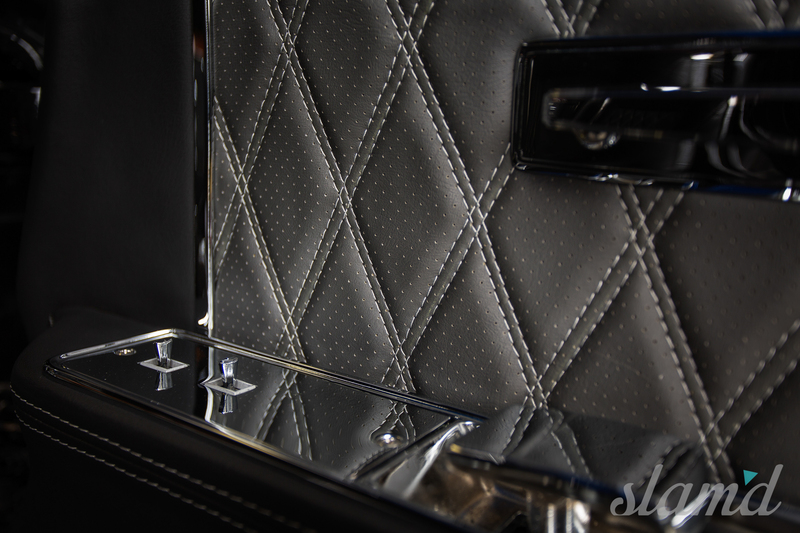 Matching black and grey panels fit the doors, while the factory chrome touch points remain in place. Custom wool carpet and mats stretch over the floor pans. 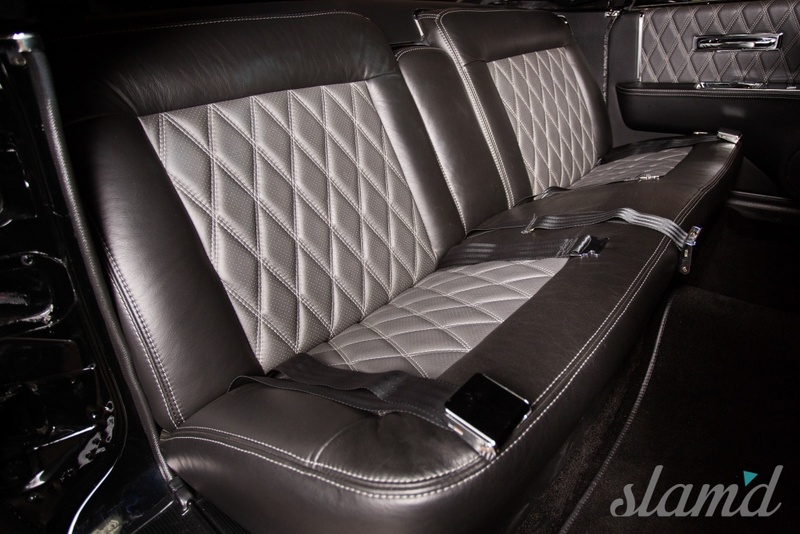 Black leather hug the dash, where a series of understated amenities are present. 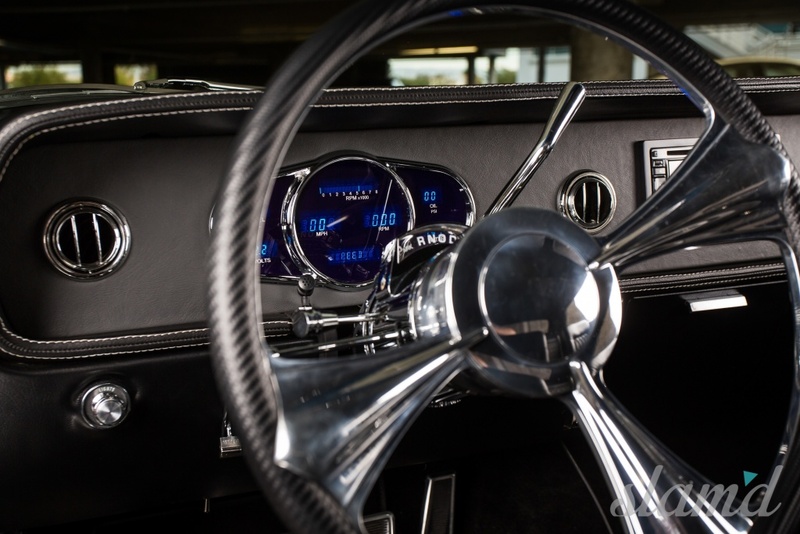 Dakota Digital VHX gauges are visible through the spokes of the Billet Specialties steering wheel. The center of the dash supports a touchscreen head unit from Alpine. The head unit moves its media through custom mount Focal speakers in both the front and rear kick-panels. 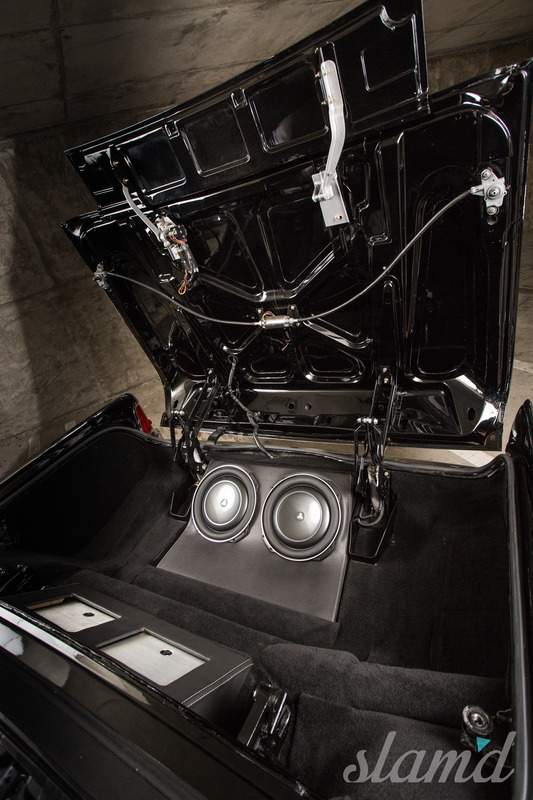 In the trunk, twin JL amps and JL subwoofers are handsomely mounted to custom housings. 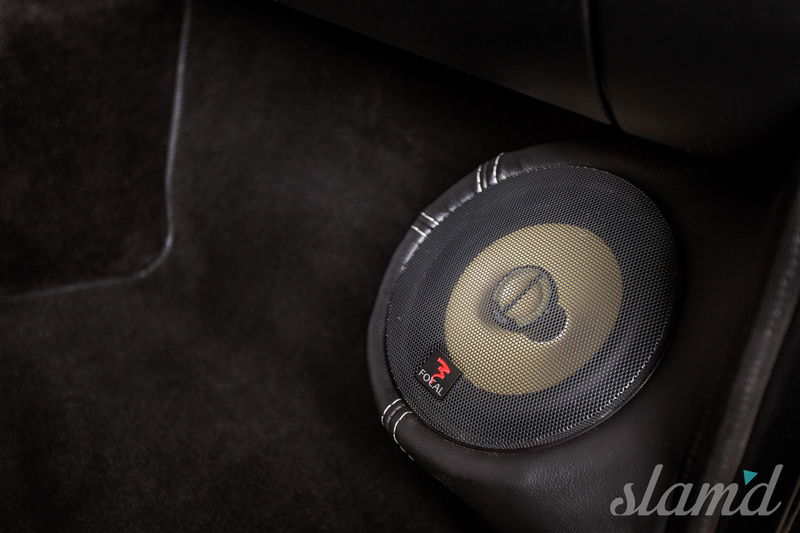 The housings are covered in extended black and grey leather. The interior delivers uninterrupted luxury that preserves the factory design language and appeal. It is both simplistic and extensive, refusing to cut any corners. A lack of cut-corners is characteristic of Tony’s build style, always leaving no stone unturned. 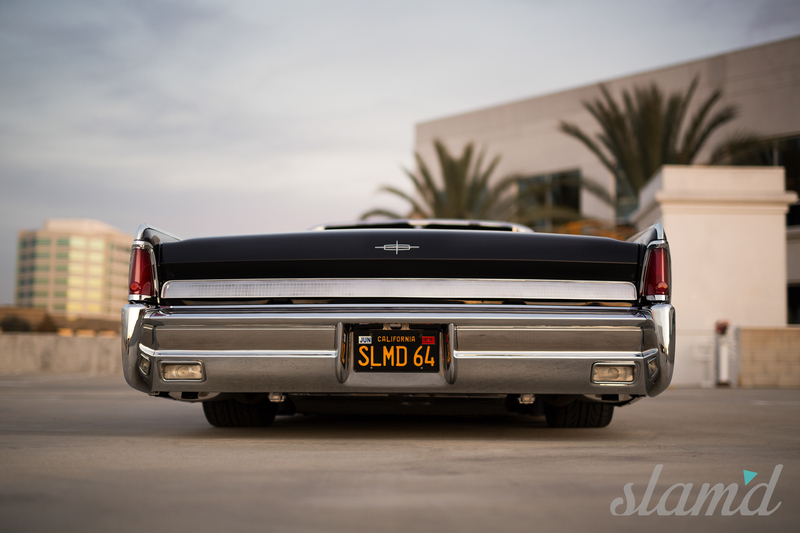 SLMD64 represents a necessary end of the custom spectrum that puts the utmost priority on quality from top to bottom. Every inch, inside, outside, and underneath, has been brought to standard. The sum raises the bar for other builders and challenges the industry to evolve. The constant arms-race accounts for an expanding network of enthusiasts and industry members. The attention garnered inspires others to level up. Tony has poured his passion, time, and resources into his ’64 and as result, into the industry at large.